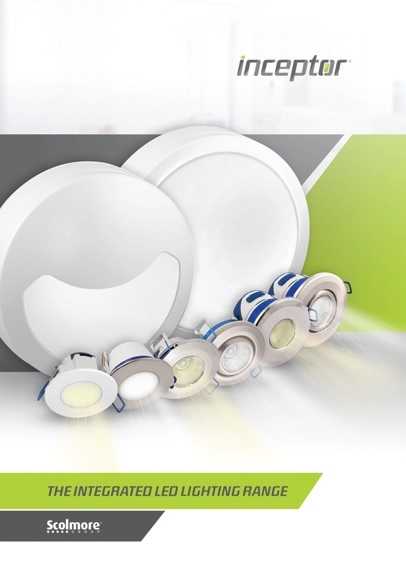 As Scolmore continues to develop and expand its Inceptor integrated LED downlights range, it has produced a new brochure which brings the entire collection together, making it easy for contractors and specifiers to select the most suitable products for their projects. The 15-page brochure provides detailed product descriptions and technical information for each Inceptor product – Evo Bulkhead, Omni Tricolour Fire Rated Downlight, Nano5 Compact Fire Rated Downlight, Pico Fixed LED Downlight and the most recent addition, Pico FG Fire Rated LED Downlight. A number of Inceptor accessories are also featured, including Converter Plates, an Insulation Support Clip and the Universal Emergency Pack. The Inceptor range has something to suit all types of installations and combines key features which makes them stand out. Each product has an integrated LED and driver. With the exception of the essential Inceptor Pico product, they all come pre-wired with both male and female Flow connectors, creating a range of lighting which is quick and easy to install as well as to remove and replace for the purpose of circuit testing. The Inceptor range is also compatible with Scolmore’s Click Smart wiring accessories. You can download your copy of the brochure from the Scolmore website.